★★★★☆ The AVR-1510s is a "Great Home Receiver" for small to average Living Rooms. Not overpowering, excellent sound. Inputs can be labeled and HDMI-CEC control lets you use your TV remote for easier volume. Pros - Lightweight, awesome VTUNER with presets edited online. Easy home network music or USB music playback. Easy on-screen menu setup is thorough. Cons - WEAK remote control, very poor design and placement of the tiny volume control buttons. Spring clip connections on Center and Surrounds. Firmware can only be updated via USB and not via ethernet. Again, this is an entry level receiver but great for those on a budget. For all Banana Plug speaker connections, get the AVR-1610S. For dual subwoofer connections, get the AVR-1710s. 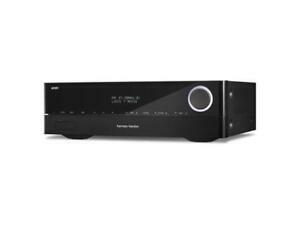 ★★★☆☆ Pros and Cons listed in the order of personal importance: Pros: It is very inexpensive You can use the remote to control other units as well as the AVR itself Produces 5.1 Dolby, DTS, PCM. 4k pass thru works (ish) Amplifier as powerful enough to drive 4 8" wall/ceiling speakers plus center. (sub is preout) Clean audio Instruction book is thorough. Cons: If you are running video through the receiver (HDMI only), you cannot use an alternate audio input such as optical (for me that means I cannot switch the HDMI PC output to my VR HMD and still maintain 5.1 audio to the room without switching inputs and source settings). This very frustrating and seems like a simple fix in the engineering stage. The menus and setup are ridiculously difficult to navigate using on device buttons and it comes with a very frustrating remote to learn (mostly due to its ability to control other sources) that may make you prefer the on device buttons. 4k pass through works, but it will sometimes default to a 30Hz signal which is not detected by my Samsung display. I'm still researching why, but I believe that means HDMI out on the AVR is HDMI 1.4 instead of the modern standard of 2.0+. If so that's it, it's not a problem if it's listed as such in the specs. I include it because it seems like more of a problem an old HDMI standard. Banana connectors only on right and left outputs where center and surround outputs are direct wire only (inconvenient for disconnect/reconnect). (also shown in pictures which I knew before I purchased; however, it still seems silly to me that it would be made this way). As far as I can tell you cannot make it always run in sleep mode such that it will turn on when detecting input which means you have to keep the remote handy (or press the power button) every time you use your source after an hour or so of idle. ★★★★★ I received my well packed box a couple of days early. Everything was there that I needed to get my new receiver up and running in short order. I recommend this product to anyone that is upgrading their system. The price was fair and you get what you pay for. I highly recommend this! ★★★★☆ I got this at a steal of price. Its sounds awesome works well but has one flaw... Not easy to use. Remote is very poorly designed. It is however a great bang for you buck at this price point, looks stylish and sounds exceptional. Wish I could give 4.5 instead of 4 stars. ★★★★★ I'm a big fan of Harman Kardon products and this receiver is a great value for under $200.00. The 1510s has the HDMI connections you want for newer blu ray players, etc. along with the other features you would expect from a high end receiver. Most important factor is sound quality and this is where the 1510s really shines. Great sound processing and separation! If you decide to buy it be sure to pair it with the best speakers. I chose Harman Kardon HKTS 5.1 and together they make an outstanding system.